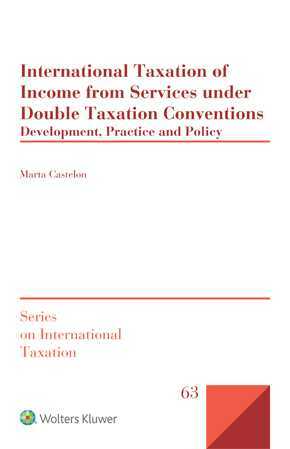 International Taxation of Income from Services under Double Taxation Conventions: Development, Practice and Policy provides an overview of the taxation of income from services under double taxation conventions (DTCs) in major jurisdictions across the world. Especially due to the precipitous growth of the digital economy and thus the increased internationalization of services provisions, the international taxation of services has become a dominant focus in international taxation. This multiple-award-winning book is a major contribution to the debate about tax reform. It responds to the need for a comprehensive overview of the tax opportunities and risks relating to the provision of international services. With a thorough analysis of the international taxation of income from services over the past two centuries, the author sheds new light on present tax policy debates and develops workable proposals for bringing brick-and-mortar DTCs into the digital reality. proposed changes to amending the OECD and UN Model DTCs. Viable proposals to simplify DTC provisions dealing with service income and to align them with current challenges such as the digital economy and the increasing volume of remote services are offered, particularly in light of the likely impact of the Base Erosion and Profit Shifting (BEPS) package and its subsequent MLI. As the first in-depth analysis of the taxation of income from services vis-à-vis the MLI resulting from the OECD’s BEPS initiative, this book is poised to become one of the key practice resources for tax lawyers, in-house counsel, and policymakers. This book thus serves as an indispensable tool for practitioners and interested academics who will benefit from the author’s skill in recognizing the ongoing role of taxation fundamentals in the major revolution currently underway. Do Legal or Economic Principles Provide an Answer as to the Division of the Right to Tax?